TSE 985: TSE Certified Sales Program - "Fear of Prospecting"
Today on The Sales Evangelist, we’re going to talk about the fear of prospecting, how your coworkers often contribute to it, and how you can overcome your fear of rejection. 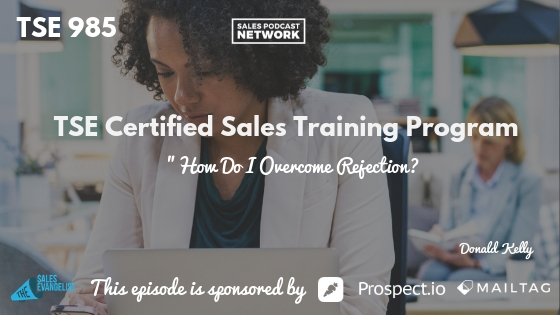 Fear of rejection often keeps salespeople from going after potential deals, but it doesn’t have to be this way. If you’re a new rep and your teammates warn you to stay away from a certain account, it can cause you to fear to reach out at all. He spoke to the prospect’s receptionist and he left information with her that she could pass on to the VP of the company. Several days passed and he didn’t hear from the receptionist or the VP. Fortunately, his confidence outweighed his fear of rejection. He called the prospect at 7:30 a.m. and was able to talk to the exec because the receptionist wasn’t there yet. Eventually, he closed the deal that his coworkers said couldn’t be closed. His co-workers could have solved the problem as well, but they allowed the warnings and stories to intimidate. They never reached out to him. Fear results when we believe that someone is going to cause us harm or pain. But how does that belief come into existence? Because we were taught or coached to be fearful of the word no. When we were kids, we didn’t fear being told no. But as we got older, we became conditioned to the idea that no is bad. To overcome fear, you must develop confidence in what you have to offer. The more times you successfully solve problems for comp0anies, the more confident you’ll become. If you make enough calls, speak with enough prospects, and solve enough problems, you can become more confident. You’d never be where you are right now. Instead, because you kept doing it, you became confident. If you listen to the very first episodes of this podcast, you might think I should have gotten more training before I started. Now, 985 episodes later, we’re still creating episodes. Imagine all the money we’ve generated, the business opportunities we’ve created, and the salespeople we’ve helped over the years. You must have a belief that is stronger than fear. [9:30] Gain that by doing things over and over again. 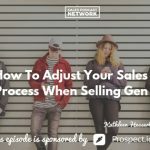 Also, gather as much intel as you possibly can about your prospect’s problem. If this episode was helpful to you, share it with someone else who can benefit from it. Help them overcome their fear of rejection. The TSE Certified Sales Training program targets new and struggling salespeople working for small to midsize companies. The sales training course will help you plan your day, understand prospecting, build value, and convert more customers. You can work through the course alone or as part of a group of 25 people. Click here to learn more or to register for the next course.